The party continued their trek through the tunnels under the Isle of Dread. They came upon a carven dripping with moisture, where Irgzid called them to a halt before entering. He warned that the chamber was filled with noxious fumes,and some of the slaves that the troglodytes had brought this way previously had died here. Milky pools dotted the cavern floor, and water dripped steadily from numerous stalactites, filling the air with a sharp metallic tang.Irgzid suggested the party hold their breath as they hurry through the chamber, trying also to avoid the pools, and make for the ext to the southwest. Mendel fired an arrow carrying Stefanie’s light enhancement in the direction Irgzid pointed to try and light up the exit. Antony spotted a part of dark shadows did not seem to move as light filled the area, and fire another arrow – suddenly, there were two patches of darkness. As Antony and Mendel edged forward, these dark blobs became clear as black puddings, slowly edging towards the group. Mendel led a retreat to the tunnel as Zhedd and Dacien launched fireballs at the oozes, until only one particularly stubborn pudding remained. Mendel stepped up to throw oil over it, but got caught within the ooze itself, causing his newly acquired armour to melt. Antony used his Ring of the Ram to knock it backwards, as it finally fell to another fireball. An unexpectedly costly encounter, the party grimly pressed on down the tunnel. Up ahead, Irgzid warned, was a large cavernous home to a roper. The troglodytes would feed it slaves in order to get safe passage through its home. Dacien recalled that ropers were surprisingly very intelligent and spoke Terran, so Zhedd offered to try and negotiate passage.The chamber itself was at the base of a steep cliff face, and held a petrified forest, clearly swallowed by the earth some millennia ago. Zhedd mounted Banshee and flew into the chamber, calling out to the roper. It responded, demanding some form of tribute before it would allow the party to pass – and indeed that dire bat looked particularly tasty. Zhedd flew back to the party, and led them down the cliff face with the plan of summoning a bat to appease the roper. It recognised the casting of a spell, and enraged, dared the party to cross its domain. (DM note: it was a nice idea – maybe summoning it out of sight and earshot of the roper would have been better!). Keeping an eye out for the roper, it was hard to tell what was stalagmite and beast, so it caught the party unawares and ensnared Zhedd, Mendel and Faldak. All fought off its strength-draining power, and started hacking at the strands wrapped around their middle. Ji dashed forward and started pummelling the creature with his fists. Stephanie and Antony started helping the others escape, but Antony found his strength drained by the roper, and was barely able to move. Dacien stepped up and dimension door’ed himself, Mendel and Faldak right behind the roper, allowing the group to flank it and finally destroy it. Having looted the treasures the roper had collected over time, the party camped in the cavern to rest from their encounters so far. The next morning, Mendel, Ji and Faldak had thick dark scaly blotches on their skin – much like the troglodytes, and Stefanie and Zhedd set to work curing them of the disease. The next day, Irgzid led the party to another chamber on the passageway the troglodytes use to collect the shadow pearls. This was lit by a strange translucent shimmering blue veil that bisected the cave. Ghostly images of tribal warriors occasionally flitted across the veil, and whispering voices that uttered strange prophecies about lizard kings and demon fish. Dacien used his divination magic to analyse the magical wall, and was nearly overcome by its power – clearly artefact level magic at work in its construction. Dacien later spotted that the wall had a slight curve to it – that it may be part of a large sphere, with a centre likely some miles deeper in the earth. Irgzid impatiently beckoned them through, and the party gingerly followed. The air on the other side of the veil was noticeably drier, and a strange back and forth flow of breeze reminded them of breathing. A little further down the tunnel, Irgzid paused at a large fissure in the wall, and explained that there was a small community of strange humanoids that lived nearby in a place they called ‘Barbas’, Which Zhedd thought sounded like the elven word for Haven. Irgzid had not visited in some time, since he was a child on a trading expedition. He offered to take the party there to meet with the peoples, and the party agreed it couldn't hurt. The settlement was guarded by a maze lined with dangerous and deadly yellow and brown moulds, which Faldak navigated the party through with Ji’s help. A clattering from up ahead caught the party’s attention, and 8 hook horrors were visible lined up against the settlement wall, banging their arms on their shells to raise the alarm. Pale faces appeared at the wall, and after the party had reassured them they carried no disease from the troglodytes, the party were granted entrance to Barbas. They were greeted by the village leader, Vertram, a tall albino with features similar to a kobold. The other villagers were a strange albino mix, with features from several different humanoid races – orc, goblin, but in odd combinations within each person. And they seemed to be able to interbreed. Vertram led them through the village, where the party saw water being conjured into a large pool, with copses of large fungi nearby being harvested. Vertam mention that a being called ‘Ruffel’ was their spiritual leader, and had recently foretold of the strangers arrival – a signal for Barbas to be deserted. Ruffel was found to be the skeletal remains of an elf, kneeling in prayer before a series of religious verses carved on the walls of the cave, each speaking of Ruffel's guidance for his followers. One verse added more recently stated that strangers would signal the time for the people here to move on, under the guidance of Ruffel. Vertram indicated that only recently had Ruffel spoken to him and given him this vision. Mendel knew something of the albino Shadow Elves and their worship of an immortal named Rafiel – it seemed that these isolated creatures were somehow related. He passed on contact details for his house in Darokin, and wished them well as the village began to pack up their belongings. It wasn’t clear how they would get off the island, and Vertram was not even aware of the island or the sea, but they seemed confident that ‘Ruffel would guide them’. Before they left, Vertram offered to show the party another place where the blue wall was visible – near the ‘Sleeping One’. This was in another small cave, where a statue of a large fish-like creature rested next to the blue wall – beyond which blind cave fish were visible flitting around in the light. The wall appeared to be holding back the sea water. The statue was puzzling Dacien, who had heard of creatures known as aboleths, evil psionic fish creatures that enter a state of hibernation when deprived of water. A slow sloshing heart beat could be heard by pressing an ear to the statue, and getting the statue wet turned the other layers of stone to sickly mucus. The party eventually decided to hack through the statue and kill the slumbering beast. As the party continued on the main passageway, Irgzid became more excited growing closer to the presence of his ‘ancestor’. A large chamber appeared up ahead, and Irgzid dashed forward calling out to the spirit. The chamber was an inverted ziggurat, of Oltec design much like the engraving the party had seen on the Great Wall at Tanaroa; upon further inspection, Mendel saw the engravings depicted the victory of an Oltec civilisation over some threat from beneath the earth. The lower half was flooded (strange, within the blue veil), and fallen pillars former a makeshift bridge over the dark slimy water. The pale ghostly figure of an aged troglodyte appeared atop the bridge, and greeted Irgzid, before turning to the party. He explained he was a spirit of the troglodyte clan leader of old, and was trapped within this chamber, unable to rest until the threat to his kin had past. This site was where the Kopru exchanged shadow pearls for the slaves the troglodytes brought them, and the ghost had observed many of these exchanges and how his troglodyte people had slowly succumbed to the disease proximity to the newly created pearls seemed to cause. HE also explained that the areas outside the chamber were strangely devoid of water, and as the kopru were an amphibious species, they must suffer the lack of water in order to sustain the production of the pearls.He then pleaded with the party to seek out whatever artifact the kopru used to hold back the sea water and flood their production, or at least provide a distraction for the party to then assault their stronghold. Ji became increasingly suspicious of the troglodyte spirits words, and pushed the questions whilst the party looked for other clues. Dacien examined a strange sigil carved on the ceiling that looked to have been recently modified. The ghost said he had seen the kopru fly up and resculpt the sigil - and urged the party to undo their work. Dacien then used a spell to examine the sigil and found it to be an aboleth glyph that had once enhanced their ability to enslave other races, but now had been altered to suppress that ability. The ruse was up. The troglodyte ghost admitted that he was an illusion created by the aboleth to make communication with them easier. He lied to Irgzid to find help, to lead a strike back against the kopru. The aboleth claimed to have lived in a large city deeper in the earth, which he called Golismorga, and waged a war with the Oltecs in their empire of Thanaclan on the great plateau of the Isle of Dread. The Oltecs somehow cast the water out of Golismorga and drove the aboleths into hibernation.The kopru had found him, and used a decanter of endless water to revive him, trapping him in this pool, whilst suppressing his enslave ability. The fact the kopru could alter the glyph suggested they had learnt much of the secrets of the aboleths, although for whom it was not clear. The Aboleth also mentioned being a servitor of beings beyond the knowledge of even the Immortals, and that Zargon was a patron - a name the party recognised from dealings with Thanti Sparrow on his travels from Cynedicea. He still begged the party to destroy the artifact that held the water at bay, to disrupt the kopru activities - but the party were more resolved to find a way to destroy the kopru and not release countless aboleths from their slumber. Back from their shopping trip in Sasserine, the party met with the Farshore council members to discuss the next move. The consensus was to investigate the 'Lords of Dread' and the troglodyte caves on the northern shore of the island that seemed to be the source of the Shadow Pearls. Lavinia shared a little more information from her mother's journal on the dragon turtle - known by the natives as 'The Glutton', a particularly large specimen for his kind. Lavinia offered some of her family's treasures as a 'tribute' to try and buy passage, which the party accepted, despite Manthalay's protestations that the beast should not be negotiated with, and if anything it's carcass should be dragged in front of the villagers to let them know their place. The party ignored this, although did mull over killing the beast if the opportunity arose at low risk. Lavinia was keen that the party find some news to help avoid the suspicious whispering from the villagers since her brother's appearance. Before the party set off, Lavinia called Antony to one side, and further to his efforts campaigning on her behalf, asked him to accept the role as emissary of Farshore, to act as her representative in fostering trade links with other ports and merchant guilds. To help with this, she gave him the command of the Brine Harlot, and appointed one of the newly freed slaves as its captain under Antony's command. Nosmo Beldan introduced himself as a Minrothad captain of some experience, whose had lost his ship off the coast of Ochalea to the Sea Reavers of the Crimson Fleet, and had pledged his service to the colony for a year in return for his freedom. The party worked with the captain to plot a route to the north of the island - following the eastern shore so they could also look in on the wreck of the Sea Wyvern. Joining them on the journey was another freed slave named Ji - an Ochalean monk in the service of Tarastia from the Jade Raven monastery. They set off the next day, and had good winds and calm seas on the voyage north. The party decided to weigh anchor near anchor near on of the reefs to try and find a clan of Tortles to communicate with, and question about the dragon turtle. The eventually managed to catch the attention of a trio of tortle warriors, who came to the surface. The party quizzed them about the dragon turtle, learning that his lair included the tortle breeding grounds, which he guarded but at a heavy price from the tortles in terms of tributes and occasional slaves. Some tortles worshipped the power of Emraag the Dragon Turtle, but this was not a commonly held view, and these tortles would support an attempt to remove him. They also helped the party learn to use the sea skirl - the strange alpine horn type instrument which was mounted on the bow of the ship, and gave the PCs a few pointers on how to play it acceptably. Stefanie paid most attention to the lessons, more by a process of elimination rather than natural aptitude. The next day, the party made it to the wreck of the Sea Wyvern. Keen eyes spotted some movement near the ship, and a large elasmosaurus in the waters. Nosmo took the Brine Harlot in closer, and as the party kept weapons trained on the ship, the elasmosaurus attacked. 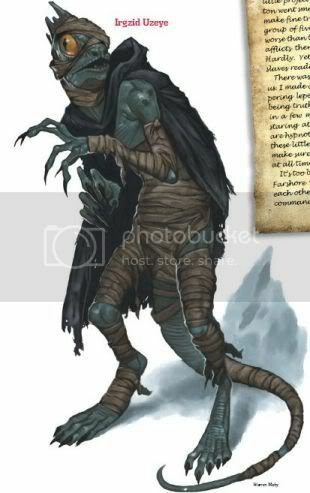 Another figure darted out from the ship into the water - a kopru that tried and failed to dominate one of the party. The party soon dispatched the large dinosaur, but the kopru summoned a swarm of sharks and shapeshifted into a shark itself, to confuse the party, as it rained bolts of lightning from the heavens down onto Mendel in the crows nest. The battle ended in a standstill, as the sharks swam off, the kopru unable to make much headway from the waters. The party investigated the Sea Wyvern to find the kopru had been using it as a base of operations, seemingly in the process of crafting a magical necklace. The Brine Harlot weighed anchor in the cove, with instruction to wait for a couple of days before returning to Farshore, and the party set off in rowboats to a makeshift jetty of driftwood and bones that was visible in the cliff face of the cove. The jetty was shrouded in a sickly green smog, arising from humanoid skulls being used as braziers and burning a potent mix of herbs and fungi. Some of the party struggled with the smell, as Ji snuck forward along the jetty. A dinosaur was visible in the cave, and began barking as Ji approached. Angered by the party, it broke its chains and charged down the rickety pier to attack. The pier shook and the vibrations threw Stefanie and Ji into the water. The dinosaur was a sickly beast, it's hide tough and blackened, and nasty looking cuts marring its skin around the joints. a dark paste had been liberally applied to the wounds, but the exposed flesh was an angry red beneath it. The battle with the dinosaur, and recovering the PCs from the water, alerted some troglodytes from deeper in the cave. They called out, realising the PCs were not the pirates after they told them they had no more pearls. Dacien sent a fireball into the cave, and the troglodytes scurried back into the darkness. In pursuit, the party found signed of the shadow pearl distribution - broken geodes with spherical hollows that once housed the pearls were scattered on the floor. The geodes looked valuable but seemed to be made of an alien substance that caused a mild headache when touched. Tracks lead to a passage deeper in to the caves, and crude frescoes detailed the troglodyte religions beliefs - showing a dragon raining black pearls from the sky down on to the land in a scene of destruction. What was noticeable was a crude second head had been added to the dragon since the carving was originally done. The party followed the caves deep into the cliffs and down into the depths of the Isle of Dread. After several hours, they came across a larger cave, caked in filth and swimming in the stench of decay and troglodyte musk. A crude troglodyte settlement filled most of the cavern, but the troglodytes themselves barely registered the PCs presence, wallowing in a deep lethargy. Each wretched creature has the same dark toughened skin marred by deep red welt and exposed flesh, and were swaddled in bandages that drip a dark ichor. In the midst of their hovels, was a large pit filled with black bubbling decaying bodies of troglodytes and other humanoids. Hanging above the pit were several large cages containing the bodies of other troglodytes - including one live troglodyte and a human tribal native, covered in animal tattoos. The human was drooling and had a vacant look in his eyes that Dacien deducted was caused by a Feeblemind spell. The party resolved to send him back to Farshore until he could be healed. When the live troglodyte saw the party he scurried across his cage, and excitedly beckoned them over. He introduced himself as Irgzid, and begged the party to set him free. Irgzid explained he was a priest of Pearl, the immortal rule of chaotic (evil) dragons, and he feared for his people as the clan had been infested by another malign influence, and he begged the party to help him. The disease that ravaged his fellow troglodytes was at first through to be a gift from Pearl as it toughened the skin and made them stronger. But Irgzid had noticed a change in his fellow priests who didn’t seem to be acting in the best interests of the tribe, and were devoting their efforts to the transfer of Shadow Pearls from the kopru in the tunnels below to the pirates of the Crimson Fleet. The disease was a curse not a blessing, and slowly encased the creatures in their own toughened skin, as revealed to Irgzid by the ghost of one of his ancestors in the caverns below. But when his fellows discovered that Irgzid had not succumbed to the disease, they branded him a heretic, and locked him in a cage before he could rally an uprising against his fellow fallen priests. Irgzid promised to take the party to where they sourced the shadow pearls and to meet the ghost of his ancestor, if they helped him return his tribe to the rightful worship of Pearl. Irgzid led the party through the settlement to a sinkhole that led to ttunnels into the depths. A statue of a large dragon looked over this, again with a second head added more recently. Having fought their way past some sickly troglodyte priests, Irgzid led them down the lift in to the passages. |He told the party it would be a journey of art least a few days to get to the site. Barely an hour out from the settlement, the party were attacked by a beholder, and by several strokes of luck were able to avoid the most damaging effects of its rays and managed to kill it bya well-timed flame strike and then lassoing it to Faldak, who scraped the monster to death against the tunnel walls as he fled in fear, trailing the beholder behind him like a balloon.